The Shadow of the Tomb Raider ending brings Lara Croft’s origin story to a close, but if you weren’t paying close attention you may have been left a little hazy on exactly what transpired during the ending and post-credits scene. That’s where we come in, with this quick roundup and analysis of Shadow of the Tomb Raider ending. We’ll break down the plot and clean up any possible confusion, but also ruminate on what this ending means for Lara and the future of the Tomb Raider series. We will also take a look at the original Shadow of the Tomb Raider ending, which was found in an unpatched copy of the game. It goes without saying that many, many story spoilers lie ahead, so if you are yet to complete Shadow of the Tomb Raider and want to experience it totally fresh then click away now. Near the end of the game Lara finds herself in an exceptionally rough situation, with her chief antagonist, The Order of Trinity, in possession of both the Key of Chak Chel and the Silver Box of Ix Chel. With both of these items in his possession, Trinity’s leader Doctor Pedro Dominguez (or Amaru, as he’s known in Paititi) and the Cult of Kukulkan are free to control the Mayan apocalypse and use it to reshape the world in their favour. Naturally, it’s Lara’s job to stop the final ritual being completed, and she’s got both the rebels of Paititi and the Yaaxil tribe on side to help her. While the Paititi rebels conduct a direct attack on Trinity, Lara attempts a more stealthy approach through the initially hostile Yaaxil tribe. Upon arriving in their territory Lara sees that the Yaaxil tribe are under attack by Trinity and learns that they also play a vital role in the prophecy to return the sun. Lara joins up with Crimson Fire, leader of the Yaaxil, and the pair and the tribe battle their way to the summit where Dominguez is performing the ritual. By interrupting, Lara has to battle a now-godlike Dominguez who’s got the power of Kukulkan coursing through his veins. During the fight Lara manages to grab the dagger from Dominguez, instilling some of Kukulkan’s power in her, which she uses to defeat Dominguez and the other members of Trinity’s High Council. Lara kills Dominguez by plunging the Key of Chak Chel into his chest, putting an end to his plan to remake the world and avenging her father by killing the man who ordered his assassination. With his dying breaths Dominguez places the Key of Chak Chel firmly in Lara’s hand and asks her to protect Paititi. The power of Kukulkan transfers to Lara, allowing her to remake the world, too. At this point she has a vision of a happy childhood memory with her parents, which suggests that she is considering using the apocalypse to bring her parents back. Lara turns away from her family and the dreamlike vision to see Crimson Fire awaiting her – they still have to sacrifice a god in order to complete the ritual. With Kukulkan now residing in Lara she prepares to make the ultimate sacrifice to preserve the world and Paititi. Crimson Fire stabs down with the dagger, which stops just above Lara’s chest and draws the light of Kukulkan from her body. The Eclipse disappears as the light leaves Lara’s body and the screen fades to white, leaving us a little unclear as to the fate of the our hero. Two days later we’re at the funeral of Uneratu where her son Etzli says goodbye and shares a his hopes to reunite and rebuild Paititi after decades of unrest. Lara and Jonah go there separate ways, Lara wanting to stay and help Paititi while Jonah heads off to the coast with mechanic and love interest Abbey. The credits roll, but the story isn’t quite over yet, as Shadow of the Tomb Raider also has a post-credits scene that wraps a tidy bow around Lara’s origin story. In this scene we see Lara writing to Jonah, reflecting on her latest adventure, while sat in the study of Croft Manor; a house she has avoided throughout the rebooted trilogy as she has always associated it with tragedy. Lara has found closure in killing Dominguez and seems for the first time in the series to be happy and at ease. Around the room you can see relics from all three games, as well as a drawing Lara presumably made as a child with a dinosaur front and centre, which is a little nod to the PS1 era Tomb Raider and possibly even a suggestion of where Camilla Luddington’s Lara Croft is heading next. We also get a glimpse of the Croft’s loyal butler, who enter’s Lara’s room with a tray of tea. He’s visibly shaking, which could be a callback to Tomb Raider 2 where Lara locks the butler in the freezer. Most likely he’s just a bit old and fragile, but it would make a great easter egg. With that post-credits scene, Shadow of the Tomb Raider is over, bringing the Tomb Raider origin story to a close, but leaving the door wide open for more adventures with the rebooted Lara Croft in the future. For now at least, Lara wants to spend some time “around the living” before exploring any more tombs. That’s all there is to it, the Shadow of the Tomb Raider ending is pretty anodyne. Currently, it doesn’t look like Square Enix have any plans to continue this Lara’s story as Camilla Luddington, who has played the Tomb Raider in each of the last three games, says she doesn’t know whether she’ll be called upon for a new Tomb Raider. So we may have to wait some time to see Lara Croft battling it out with dinosaurs like she did back in 1996. The alternative Shadow of the Tomb Raider post-credits scene might offer some insight on this however. 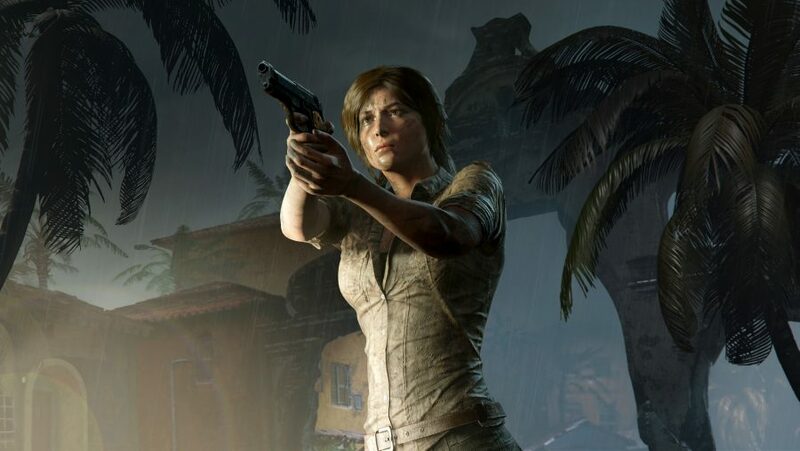 This new Shadow of the Tomb Raider ending was found in unpatched copies of the game and features a couple of new easter eggs and changes, all of which point very strongly to a reboot of the the 1996 game that features Camilla Luddington. Give it a watch below. The first tweak is that you can spot a pair of pistols on a small in the background, which were the weapons of choice for the original Tomb Raider. We also see an unopened letter on Lara’s desk that is from Jacqueline Natla, the villain of the 1996 Tomb Raider game. This alternative post-credits scene clearly alludes to a reboot of the original Tomb Raider series, so it’s not surprising that it was changed.